Nestled between Gumusluk and Turgutries, the villa comprises of two 2 bedroom well appointed downstairs apartment in Kadikalesi are situated in a large garden with shared marble infinity pool with a western facing panoramic sea view with an incredible sunset every night. The apartments are perfect for a group of friends or large family looking for a private and relaxing holiday with spacious, fully equipped and comfortable accommodation. 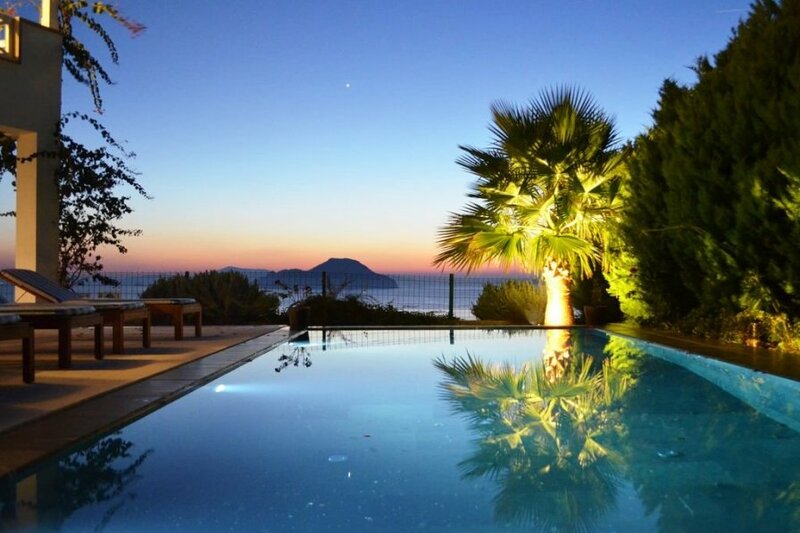 The pool, is 9 meters by 3.5 with an infinity edge facing the sea. The pool has stairs for easy access. The downstairs apartment can accommodate up to 4 people comfortably with one queen sized bed in the master bedroom & en-suite, two single beds in the second bedroom and a convertible sofa bed in the living room. Both kitchens appliances include a built in stove top with four gas burners, a built in electric oven and dishwasher and large refrigerator with freezer, filter coffee maker. There is air-conditioning throughout with separate units in each room on both apartments. The large terrace has comfortable teak furniture and lounges that can be moved to any location in the large garden. Both apartments are well equipped with satellite TV and wireless internet. Its a PAYG Vinn Wifi of which the first 15GB is free. The villa is situated in a complex with a large communal pool, tennis court and a beach 300 meters away. The upstairs apartment, has 2 double rooms (one en-suite), living room/kitchen, family bathroom and furnished terrace with BBQ. There is a view of the Aegean Sea and Greek Islands (11 islands in total) from every angle of the garden and from within the flat. The apartments have an attractive decoration with ceramic tile throughout. The apartments are western facing with a spectacular sunset view every night. The apartments are in a prestigious complex with shared social amenities including an Olympic sized swimming pool, tennis and basketball courts. There is 24 hour security on duty. The complex is located 300 m from the sea and 250 m from the village of Kadikalesi where there are some shops and sea side restaurants, many serving fresh locally caught seafood. There is a beach area specified for use for those staying at the complex. The beach area reserved for the complex is in front of one of the restaurants on the seaside in Kadikalesi, where service is provided throughout the day and in the evening it turns into an elegant restaurant with tables on the beach, right next to the sea. During the day service is provided to the lounges, serving food, drinks and decent local wine. The Bodrum Airport is located 50 km from the property and the city centre of Bodrum is 20 km away. It is recommended that you rent a car during your stay in Kadikalesi to make the most of your visit to the Bodrum Peninsula. There is a taxi stand and mini-bus stop near the entrance to the complex.